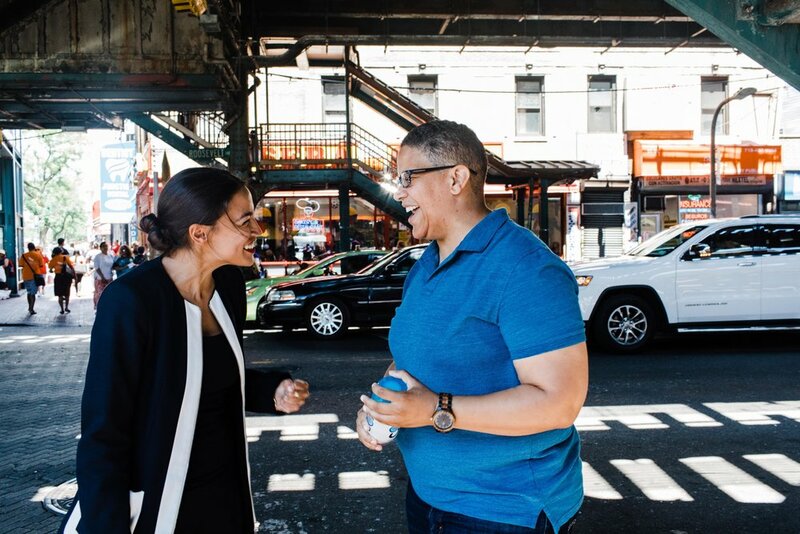 Alexandria Ocasio-Cortez, left, and Kerri Evelyn Harris, right. Photo by Kerri Evelyn Harris, CC-BY 2.0. “There is nothing radical about moral clarity in 2018,” so Alexandria Ocasio Cortez, a 27-year-old latina democratic socialist running for office in the New York 14th congressional district declared after pulling off a shocking victory over one of the most powerful Democratic leaders in Congress. Cortez’s victory was called the Democrats “Eric Cantor moment” in reference to when the former house minority leader lost his primary to a tea party challenger setting off a cascade of establishment GOP losses to younger, more conservative challengers. In the aftermath of Cortez’s victory voices ranging from establishment Democrats to right-wing Republicans to centrist media commentators all had an opinion on what it meant for the Democrats and their chances in the midterms. House minority leader Nancy Pelosi assured everyone that the Democrats are still “capitalists”, Sean Hannity of Fox news showed AOC’s platform in full attempting to scare voters with her promises to “support seniors” and fight for “women’s rights”, and commentators from CNN to the New York Times insisted and still insist that Abolish ICE, Medicare for All and calls to combat inequality in all its forms will lead to defeat in the November midterms. Still, others have denied that any changes are occurring at all, insisting that Democrats remain more united than ever. These arguments are still raging, indeed they will still go on after the midterms are over as Democrats decide what direction they wish to move in as a party. So is this rise of the left an anomaly? Is it merely a product of New York City politics? The record suggests that this is not the case. From gubernatorial Democratic Primary victories for Andrew Gillum in Florida, Stacey Abrams in Georgia and Ben Jealous in Maryland, congressional primary wins for James Thompson in Kansas, Ilhan Omar in Minnesota, Rashida Tlaib in Michigan and Aiyanna Presley in Massachusetts, to Senate primary wins for Kevin De Leon in California, Zak Ringelstein in Maine and Beto O’Rourke in Texas not to mention strong but failed challenges to the establishment from candidates like Abdul El-Sayed in Michigan, Cynthia Nixon in New York, Kaniela Ing in Hawaii and Kerri Evelyn Harris in Delaware we have seen a surge of energy coming from the broad left of the Democratic party. Organizations like Justice Democrats, Brand New Congress, Our Revolution and the Democratic Socialists of America are endorsing candidates who reject PAC money and corporate donations, want to abolish ICE, support Medicare for all and speak clearly for everyday Americans struggling to make ends meet. These candidates are laser-focused on bringing in new voters who have never before participated in the political process- the young, the poor and working class and minorities. They are against Trump and the Republican party but also the perceived centrism, loyalty to corporate interests and lack of fighting spirit on the part of Democratic party leaders. At the forefront of these movements are young people. With a collective memory shaped by unpopular, expensive wars in the middle east, the collapse of global financial capitalism, the recession and unequal recovery that followed, and a rising student debt crisis fueled by the skyrocketing cost of college many have grown to question the wisdom of the status quo. Young people are more likely to have an unfavorable opinion about capitalism, or even reject it entirely, as polling from Gallup and Harvard/Ipsos have shown. They are more likely to support a bold progressive vision of economic, racial and gender justice and they are more likely to identify as politically independent, dissatisfied with a stale political consensus that so many see as only benefiting an elite few. We are witnesses to these changes here at North Park. Students from this school, for example, were instrumental in electing Ram Villivalam a progressive Democrat running for State Senate who defeated a corrupt incumbent. In our own 39th ward North Park alumn Casey Smagalla is mounting a challenge to the machine as a gets things done reformist, and North Park students, as well as alumni and faculty, are integral parts of his campaign. All around the north side of Chicago from Andre Vasquez in the 40th ward running against a machine politician as a democratic socialist to sitting Alderman Ameya Pawar, Carlos Ramirez Rosa and Will Guizzardi a strong, anti-establishment, leftist challenge to the classic corrupt politics of the old Chicago is being waged by young, diverse and people-centered politicians. In short North Park students have the chance to participate in a revival of popular democracy in this city the likes of which has not been seen since the election of Harold Washington. But this also isn’t just a phenomenon confined to America’s cities, even if they are at the vanguard nor is it only young people who espouse these values. All across the country polls from Data for Progress, as shown in a September 21, 2018 NY Magazine article and research from political scientists Lee Drutman, David Broockman and Douglas Ahler as shown in an article from July 30, 2017 also in NY Magazine show that a majority or at least plurality of voters support ideas that centrist pundits decry as “far left”. Ideas like raising taxes on the wealthy and corporations, enacting campaign finance reform and opposing the President’s priorities on immigration. A majority or plurality of Americans support making college tuition and debt free, combating climate change with a green new deal, passing Medicare for all and some type of job guarantee and increasing investment in education, universal pre-k, and infrastructure. Even seemingly radical ideas like a public option for internet access, worker representation on corporate boards and a maximum income have more support than the media would lead one to believe. In fact, abolishing ICE is more popular than building the wall, Medicare for all is more popular than the GOP’s proposed changes to the health care system and even an incredibly high tax on the wealthy capping their income at a certain amount is still more popular than the GOP tax plan. A recent poll by the Republican National Committee found, rather embarrassingly, that among “soft Republicans,” increasing funding for veterans, Medicare and Social Security, and reforming the student loan system were all more popular than tax cuts, border security, and supporting ICE. And this makes sense, after all, Trump won states like Wisconsin and Michigan in the general election that Bernie Sanders had won in the 2016 primary and he broke with traditional conservative beliefs on social security, Medicare, interventionist foreign policy and free trade- embracing support for social programs, protectionism and a skepticism to hawkishness that is traditionally the realm of the left, and he won working-class communities in the Midwest in part because of that. Despite this, some Democrats have not learned any lessons from the 2016 election, let alone from the past decade. Over the past decade, Democrats have lost over 1,000 seats all across the country while trying to reach out to Republicans and pursue centrist moderate proposals. It has not worked. The politics of compromise and conciliation, centrism and “can I please?” have done nothing for the Democrats. The move to the left this election cycle is a reflection of this, it is born out of the anger of watching party leaders lose so often pursuing the same strategy. It is born out of knowing the challenges we face and the frustration of seeing those in power not offering up solutions equal to those challenges. This class of Democrats know what is at stake, these issues are personal to them and they are mad as hell, in short, the kid gloves are off and they are ready for a fight. At the end of the day beyond polling data and election victories, beyond the prognostications of pundits and the doomsday predictions of democratic leaders, the move to the left in the Democratic party has greater meaning. That meaning is seen in the teachers' strikes that occurred in deep red states like West Virginia and Oklahoma. That meaning is seen in protests against injustice. That meaning is seen in people at the margins of society organizing together to demand candidates who represent them. That meaning is democracy: the principle that it is the people that should rule. For too long our politics have been constrained by a narrow range of options set by elites for elites, for too long both parties have maintained an unjust status quo and while the insurgents of the right would only further entrench these inequities this left insurgency seeks to tear down the walls of racism, sexism, classism and all the other isms that dominate and demean human beings. As they push the Democratic party in the direction of human dignity this new generation of politicians, activists, and citizens is redefining the political landscape and expanding the boundaries of what is possible. This November election will serve as a first test of the left’s staying power and should it go well we should expect many more primary upsets, dark horse wins and popular pressure to hold Democratic leaders accountable. Because as the old saying goes power concedes nothing without a demand. Every advance in this country has come because people fought for it, because of struggles waged in the streets and on the ballot box, because ordinary people did extraordinary things fighting for a better life for themselves and their communities. We have a chance this November to reclaim that fighting spirit, advance our common humanity and build a country for the many, not the few.